Aaah, my first Thomas Keller restaurant. I have gone to his bakery numerous times but never dined in his restaurant. We went with a bunch of friends to Ad Hoc in Yountville. 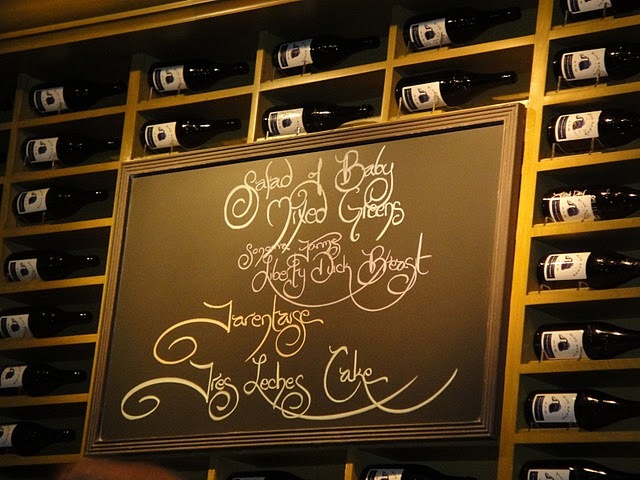 Ad Hoc has a prix fixe menu every night (closed Tuesdays and Wednesdays) and the food is served family style. Since we went in a group of eight, we had plates for four at each end of our tables. The first course was our salad of baby mixed greens. 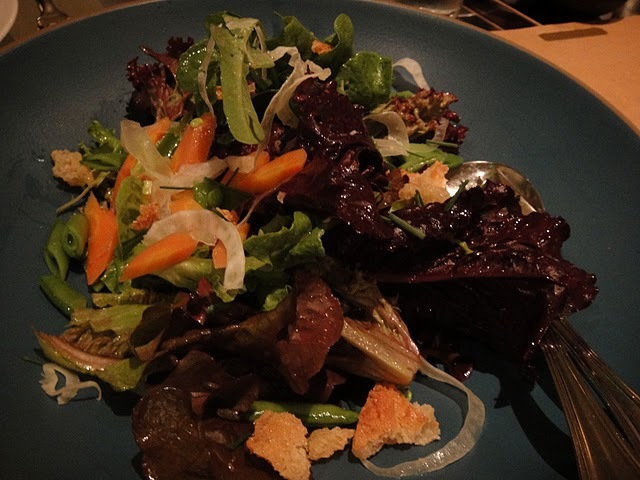 It had snap peas, shaved fennel, and carrots with a cabernet vinaigrette dressing. It was scrumptious except Katie found a hair on her plate that wasn’t hers. (dot dot dot) They replaced the family share plate but by that time, I had already consumed most of my share. Our next course was the Sonoma County Liberty Duck Breast. This isn’t something I would normally order if I had a choice off the menu but it was definitely tasty and I’m glad we had it. 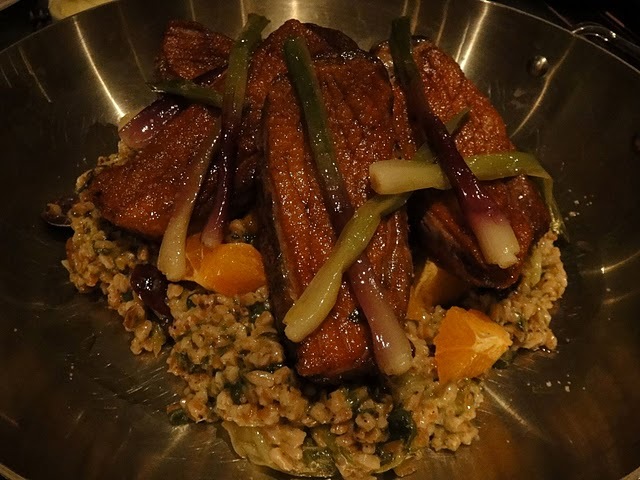 The duck was served on top of toasted farro that was a little salty from the kalamata olives mixed in but with little bursts of sweetness from the minneola tangelos. It sounded weird on the menu but it worked! I think Horace really wanted to take the all-clad serving pan home with him but we convinced him not to. 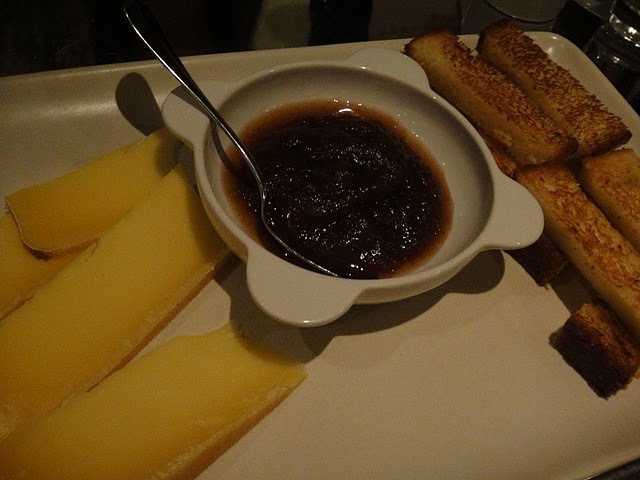 Our next course was a cheese platter with brioche bread from the Bouchon Bakery and homemade apple butter. I wasn’t a fan of the cheese so much but loved the sweet apple butter on the soft bread. Boyfriend ate my share of cheese as I usually ask him to do. 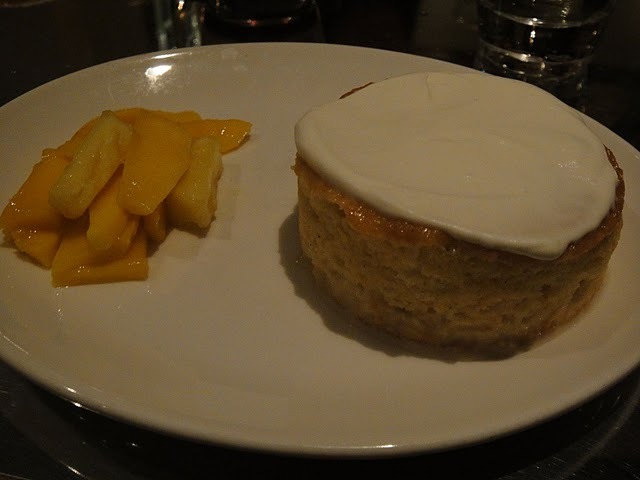 Our dessert for the night was a tres leches cake with a mango pineapple salad on the side. It was absolutely scrumptious and each bite was creamy, smooth sweetness. What a great way to end the meal! We also got talked into ordering a bottle of wine which was the special for the night. We assumed it’d be about a $40 or $50 bottle but it turned out to be significantly more… I guess that’s Yountville for you. It was a great day of wining and dining, that’s for sure! You are currently browsing the For the Love of Food weblog archives for April 2010.